U.S. egg production and consumption continues to rise, as measured by the federal government and industry sources. U.S. table egg production totaled 95.3 billion in 2018, up 3 percent from 2017. The U.S. has 328 million commercial laying hens (January 2018), up 3 percent from January 2017. 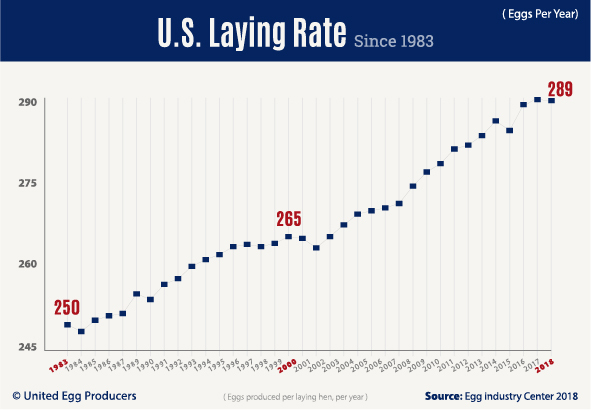 The daily rate of lay averaged 79 eggs per 100 layers (January 2018). On average, each laying hen produces 289 eggs per year. The increased productivity of hens – due to improved health and disease prevention, nutrition, genetics, and flock management – is demonstrated in the graph to the right. 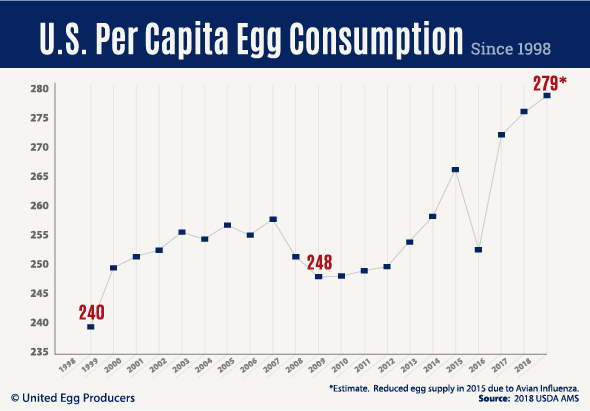 Per capita consumption of eggs has increased over 16 percent in the past 20 years. Per capita consumption is a measure of total egg production, less exports, divided by the total U.S. population. It does not represent demand. Egg production is a significant contributor to the economy and employment in several states. 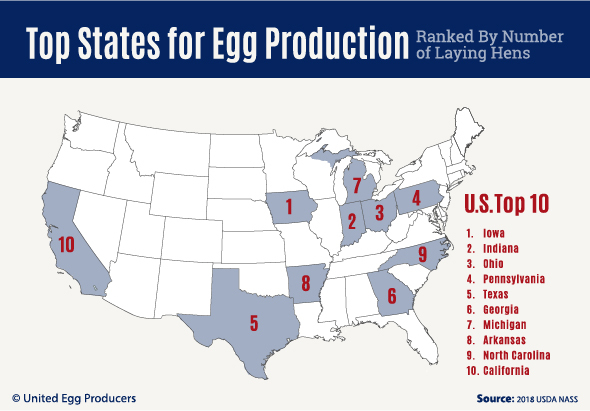 The five largest shell egg-producing states are home to approximately 45 percent of all laying hens in the U.S., and the top 10 states comprise 64.8% of egg production. Click here for more on the local economic impact of eggs. The majority of U.S. hens are housed in conventional cage environments, although that is decreasing as some egg producers and retailers, food service providers and food manufacturers transition to cage-free eggs. In 2018, nearly 18% of all hens were in cage-free production, up from 12% in 2016 and 4% in 2010. According to USDA’s Agricultural Marketing Service, approximately 71% of U.S. hens must be in cage-free production by 2026 to meet projected demand. 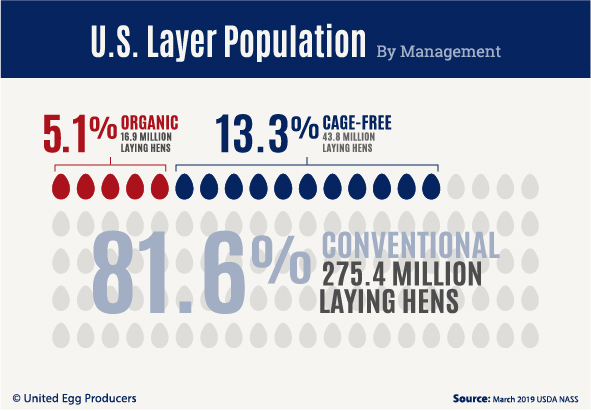 As of March 2019, organic and cage-free shell egg production accounted for 18.4% (60.7 million hens) of the current table egg layer flock. Of this, 5.1% are organic (16.9 million hens) and 13.3% are non-organic cage-free (43.8 million hens). Of the 265 million cases of eggs produced in 2018, well over half were sold as shell eggs through retail outlets. Nearly one-third of eggs produced were further processed into products for foodservice, manufacturing, retail and export. 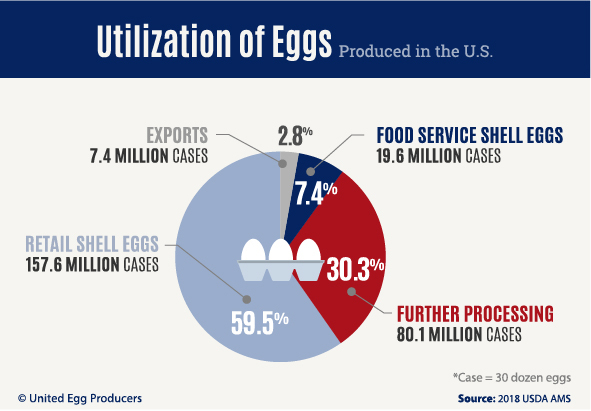 The vast majority of U.S. egg production is consumed domestically, with only 7.4 million cases of shell eggs exported in 2018.